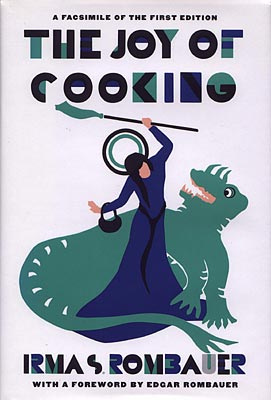 Many of us grew up with Irma Rombauer’s book on our family’s cookbook shelf. I never knew that this book, which is almost iconically kitschy, and in retrospect fairly bold for the times, was born from grief. It was the depression era, and Rombauer’s husband had committed suicide. Instead of curling up in a ball, she turned her attention to something that gave her joy, and she shared that joy with generations of cooks to come. As I was running yesterday, I was thinking of joy and thus thinking of her book. And it got me thinking about the history of running. The how to manuals and the way the sport has grown into what it is now over centuries. How at first it was just a normal part of daily life for early humans. And later it became sequestered to the soldiers and elite athletes. And for awhile there, a woman runner was likely to get stoned to death by stony, disapproving stares. And now, it is something that brings joy to so many people from so many walks of life that if you want a chance to be in a big race, you had better register early. 1. What every runner should have in their pantry. You only really need a couple of things, which is part of the beauty of running. Shoes. Find a local running store, and get to know the people who work there. My local running store guy says he can walk around town and point out people and declare which model of running shoe they wear. Running shoe should feel good the moment you slip it on. Clothes. Do not, I repeat do NOT run naked. 2. You do not have to be an expert to cook. Or to run. There will always be someone faster out there. Also, people who truly understand things like heart rate zones and VO2 max. I went to medical school, and sure I get the theory of VO2 max, but each time I have tried to devise a marathon training grid incorporating this concept, my eyes glaze over and I find myself walking to the refrigerator for a snack and a beer instead of going for a run. Put on some shoes and clothes and run. Simple. 3. Not every day produces a running high nor the perfect meal. But you still gotta eat. And you still gotta run. Sometimes I really nail dinner and my kids are all blissed out. Usually, they just shovel in the food and fill me in on the latest gossip, not really noticing the toils of my dinner making. And sometimes they just pick at the food and say “meh.” But they always show up at the table. And so it goes for running. Some days the joy is so palpable, you want to hug every one that crosses your path, and proselytize to them about how running will change their lives. Some days, you just run and your mind wanders to what you are making for dinner or what you wish you would’ve said to that mean person at work. And some days, you are just wondering why you even bothered getting your shoes and clothes on because every step is like having hot pokers driven into your nonathletic soul. Still, at least you went for a run. 4. Running is a form of play. Do you remember the very first time you ran? Me neither. But I bet it was awesome. How does a grown up tap into that? Run with people who make you laugh. Find trails and jump over things and run through streams and stop and just look at how pretty the place is. Find a sand dune and run up and down (which also happens to be a great workout). Run on vacation or business trips and get to know the city you are visiting. 5. Runners are a tribe. You don’t need to know a secret handshake. It helps to enter a race though. Any race. Stand in that group of runners at the starting line, whether it is 20 people or 20,000, and you will feel connected to something bigger than yourself. 6. The internet: not strictly necessary for running, but it sure knows the answer to a lot of your running questions. Even The Joy of Cooking has a chat room on its web site. I doubt Irma Rombauer saw that coming in 1931. Want a training plan? Injury prevention? A playlist for running? Something insane to consider? A place to run in the nation’s capital? I suppose there are at least a googol running sites out there to explore. 7. “Too much” is in the eyes of the beholder. Of course I cannot condone drinking. But my point is, people will gasp when you mention running, like it is some kind of medieval torture that you choose to do. Please remember, like eating and cooking, running is something we are meant to do, and have been doing since the beginning of time. You need only watch kids move from one place to another, with some grouchy adult yelling “Walk! No running! !” I say rebel against the grouchy adult inside (and outside) and put on your clothes and shoes and run. A lot. 8. Running can save your life. Grief. Anxiety. Fatigue. Overwhelming stress. These are all part of the human condition. Running, whether at a 6 minute pace or a 15 minute pace, serves as a balm for what ails you. The “Runner’s High” can be spectacular. But even without the full on endorphin rush, it just makes you feel better. In a basic way. Like when you stop trying to multitask and really focus in on whatever is right in front of you. Irma Rombauer knew that. Stand in the kitchen, and take some fresh ingredients and just make something decent to eat. It calms the mind. Like a run in the rain, in the woods, at the beach, or down Main Street. Nothing complicated about it. It is just plain joy. Jennifer Heidmann has been running for 30 years, racing every distance from the 400m to the marathon. Her next adventure will be tackling her first 50 mile ultramarathon. She is also a physician, a pianist and a mother of 2.9 teenagers. Check out her personal running blog, Redwoods and Running, for more great tips and stories.